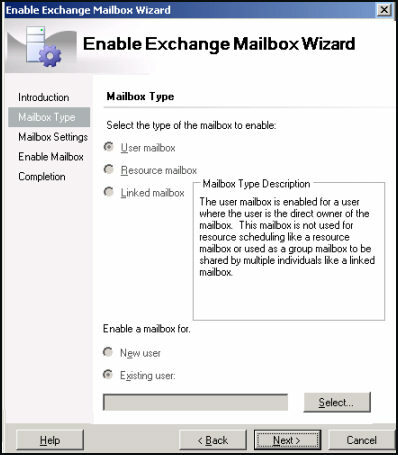 This page explains the new way of creating mailboxes in Exchange 2007. There really is a knack to enabling users’ mailboxes. If you transitioning from Exchange 2003, the the fastest way to learn is to open your mind to new ways of performing old tasks. For once, any knowledge of previous Exchange versions is a positive disadvantage. My advice is to un-learn how Exchange 2000 and 2003 rely on Active Directory to create mailboxes. Instead, in Exchange 2007, fixate on the Exchange Management Console (formerly the Exchange System Manager). Trust me, it may look as thought ADUC (Active Directory Users and Computers) functions much as before, but this is deceptive and any mailboxes created in Active Directory will only lead to disappointment. By all means create a new user object with ADUC, but do not add mailboxes with this interface, even if prompted by the wizard. Instead, switch to the Exchange Management Console and learn the technique to enable mailboxes for existing users. To achieve the goal of generating a mail-enabled user, first create a user without mailbox, then switch to the Exchange Management Console. Don’t worry if you make a mistake and and mailbox with ADUC I will explain later how to correct this error. From the Exchange Management Console, expand the Recipient Configuration container, then right-click on Mailbox. You will see on the shortcut menu, ‘Enable Mailbox…’ which encourages you to select a user and then connect them to their new mailbox. The Exchange Mailbox wizard points the way to the users via the ‘Select…’ button. Once you choose the user, click ‘Next..’, followed by ‘Finish’. When you return to the Recipient Container you should see the new user’s Display Name and Alias. Throughout the configuration, pay particular attention to the Primary SMTP Address; if you follow my method you get a proper SMTP address. However, should you try to create a mailbox with ADUC, then the trap is that the Primary Email address is blank; consequently the account cannot send and receive email. http:\\ server \owa. (This is a change from previous versions: http: \\ server \exchange). You can now logon to the mailbox by providing the Alias and Password. If you try and create a mailbox with ADUC, on the surface everything seems in order. Unfortunately, if you try and send an email then you get error messages. Here below is a diagram illustrating the problem, the Psycho user has no Primary SMTP Address, this is an indication of a problem. 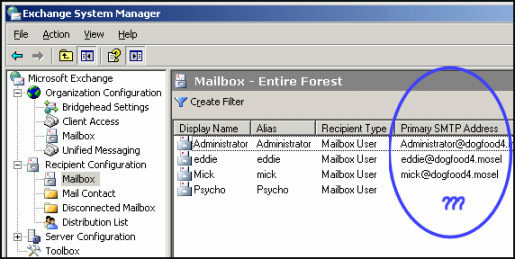 The solution is to disable the mailbox through the Exchange System Manager, then Enable the mailbox as shown in the Create a Mailbox Wizard. Note, deleting the mailbox does not work, you need the Disable / Enable routine. 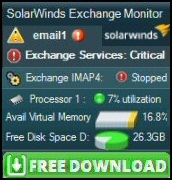 In conclusion, the latest technique is to abandon Exchange 2003 methods, which rely on ADUC, and instead embrace the new features of the 2007’s Exchange Management Console. With Exchange 2007, the past does not equal the present. What I mean is that Exchange 2007 has a completely new method of creating mailboxes. Make it your reflex to launch the Exchange Management Console when you need to give a user a mailbox. Active Directory Users and Computer is still used for creating users, but not their mailboxes.